For the ultimate in pool party luxury, hire our supremely chic and luxurious daybeds. 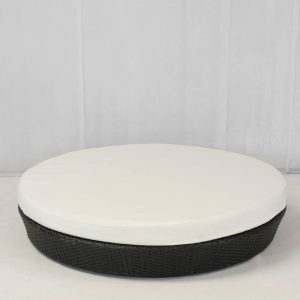 Perfect for any chilled-out event, our stunning range of daybeds will provide your guests with the opportunity to relax in style – especially when paired with an extra-large champagne bowl placed within easy reach. Lounging outside on a sensational four-poster Antibes daybed, you can instantly channel the beach appeal of its Côte d’Azur namesake, however far you really are from sun and sea. Alternatively, choose our versatile Portofino daybeds, with adjustable headrests so that you can sit up to sip your drink, or fully recline for total relaxation! 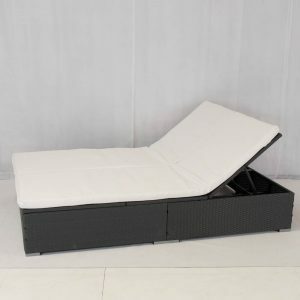 There’s just something about the decadence of a daybed that makes it ideal for recreating a beach or pool party atmosphere, whatever your venue or location. A white party sums up the best of the summer. Immaculately dressed guests can mingle and lounge on pristine white daybeds and sofas, conjuring the sizzling feel of a Mediterranean soiree. 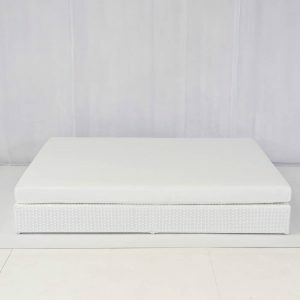 Hire some white furniture to team with your daybed, such as our white cube ottoman and our Andara modular sofa set. 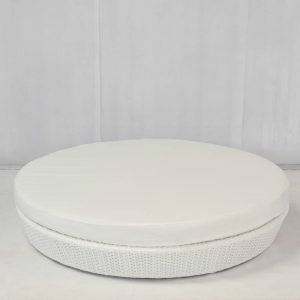 There’s no need to get nervous about spillages – despite all that white, all of our faux-leather daybeds are wipe-clean and designed for entertaining. Throwing a pool party? Let your guests relax under a parasol on our Ocean Daybed. 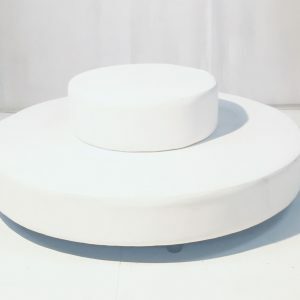 Practical as well as attractive, this unique round daybed is fully waterproof to withstand splashes, with a central area that can be used to hold a giant umbrella or as a place for guests to put their drinks. Or you can get creative and use it as an eye-catching floral centrepiece. Complete the effect with a fully-stocked cocktail bar area! If you’re after an Ibiza vibe, a chill-out area is vital and easy to create. Well-positioned low sofas and daybeds can be teamed with colourful scatter cushions to make the perfect place to unwind. Together with ambient lights and music, your chill-out area will be the highlight of the party! Why not add mirrored tables which will reflect your lighting and contribute to the overall mellow and relaxed sensory experience. If you’re planning a garden party, a daybed can create an instant talking point for your guests. 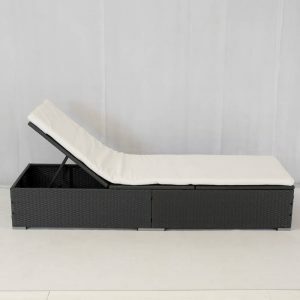 Why not hire The Tobago Daybed, an elegant, white rattan piece that will look perfect inside a marquee or out in the open air? Don’t forget patio heaters and lanterns to keep your guests comfy and warm after sundown. 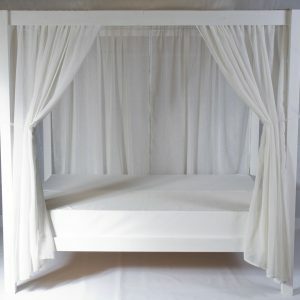 Hiring a daybed is a great way to encourage a less formal, more relaxed atmosphere. The circular shape of our Miami Daybed will gather your guests together, acting as a central point for informal mingling. Why not mix and match it with other circular furniture that’s great for groups, such as our curved Bulgari sofa set? Add scatter cushions for extra comfort and style.